Heart failure means that the heart is not pumping blood as well as it should, so the body isn’t getting the oxygen and nutrients it needs. In the early stages, patients may not have any symptoms. But as heart function worsens, people can have shortness of breath (at rest or with activity), bloating, swelling, weight gain and/or fatigue. If left untreated, the disease is life-threatening with many patients requiring hospitalization to help get their symptoms under control. 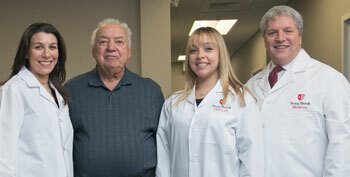 Mr. Thomas Indence is one such patient whose heart failure had been steadily getting worse. When he was hospitalized in June 2017, Michelle Weisfelner Bloom, MD, Director, Outpatient Heart Failure and Cardiomyopathy Center, discussed an advanced monitoring system, called CardioMEMSTM, with Mr. Indence to provide daily monitoring of his condition with the goal of preventing worsening symptoms. “The CardioMEMS Heart Failure Monitoring System lets us keep track of a patient’s heart function, so we can spot early signs that someone with heart failure is getting sicker and treat them without admitting them to the hospital,” said Hal Skopicki, MD, PhD, Chief of Cardiology and Director, Heart Failure and Cardiomyopathy Center, Stony Brook University Heart Institute. “The CardioMEMS device is small, about the size of a dime and is implanted via a catheter (a thin, flexible tube). It permanently resides in a blood vessel to detect pressure pushing back on the lungs from the heart,” said Puja Parikh, MD, MPH, Director, Structural Interventional Program, Stony Brook University Heart Institute. Once the patient receives the implanted device, the patient lies down on a specialized pillow for only a few minutes each morning to collect and transmit information from the implanted CardioMEMS device to the patient’s care team at the Heart Institute. Nearly automatically, the device transmits information on the patient’s fluid retention and pulmonary artery pressure securely over the internet, without the need for the patient to leave their home. If you are a patient who has been hospitalized with heart failure within the past year, or if you are a physician caring for a patient with this condition, please call (631) 444-9746 (option 4) to discuss eligibility for the CardioMEMS device or to receive more information.